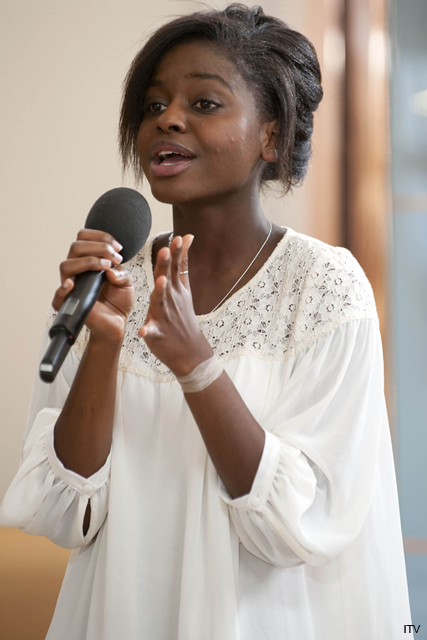 Things are looking up for rejected X Factor contestant Gamu Nhengu. Earlier this year it was revealed the singer had been ordered to leave Britain, after her family’s visa was denied. But now it seems the lucky star could escape deportation, after a last minute reprieve from immigration officials. Earlier this year, judge Cheryl Cole caused controversy by axing the Zimbabwean born singer from the singing competition, taking contestantsKatie Waissel, Cher Lloydand Rebecca Ferguson through to the live shows instead. And just weeks after her X Factor exit, Gamu faced further heartbreak, when it was revealed her visa had been denied, meaning she would have to return home to Africa. At the time Gamu revealed she featured for her life, and was terrified of being sent back to the poverty-stricken country. But now it seems the Scottish songstress could receive a last minute reprieve from deportation, after officials – who had already closed her case – decided to reconsider, granting a new hearing on grounds of a technical problem. And although Gamu isn’t completely out of the water yet, it’s thought the Home Office will now look again at her case. A spokesman for the singer revealed immigration officers must now make yet another decision. ‘It’s open to them [the Home Office] to either issue another refusal, against which there would definitely be right of appeal, or to grant my clients’ leave,’ she said. She also took the opportunity to thank the public. ‘The family want to thank everyone who has offered them such support,’ she added. And it seems Gamu’s had a busy few months. As well as her ongoing fight against deportation, the singer has also found time to record a charity Christmas single. The star will release the song – on behalf of children’s charity Aberlour – on December 13. Are you pleased Gamu’s set to stay in the UK? Let us know your thoughts in the comments box below.